Pictured below are some of the Reference Sires that adorn the pedigrees of our breeding Stallions and our Mares ... these outstanding and sort after bloodlines are the "Cream of the Crop" in modern Miniature Horse industry! It is said that "The Proof is in the Offspring". 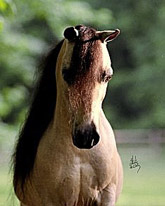 There are very few stallions that their offspring have value after the stallion is deceased or non-productive ... pay attention to those bloodlines, where they came from and what horses have those bloodlines now and the value they have. Pay attention to older established breeders and the stock they use and the pedigrees behind those horses ... that will tell you what bloodlines are truly valuable. 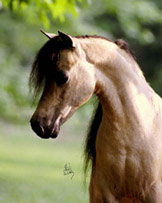 Prepotency is the true test of a great stallion! 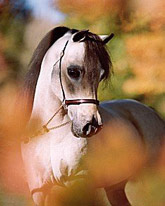 Grand-get and great-grand set with qualities of a famous stallion, show dominant genes that are desired and can still be passed on! 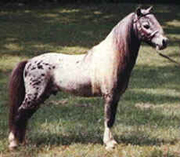 BOONES LITTLE BUCKEROO (USA) 30½"
No other NATIONAL GRAND CHAMPION SENIOR STALLION has produced not only one, but two, who are NATIONAL GRAND CHAMPION SENIOR STALLIONS! No other NATIONAL GRAND CHAMPION SENIOR STALLION has grand-sired not only one, but five NATIONAL GRAND CHAMPION SENIOR STALLIONS! This is the unmistakable, powerful, genetic consistency, that only BUCKEROO passes on CHAMPION after CHAMPION, GENERATION after GENERATION! BUCKEROO is a maternal grandson of GOLD MELODY BOY and owned by LITTLE KING FARM. 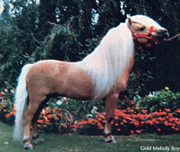 He is without a doubt, the most well-known miniature stallion in the world today. 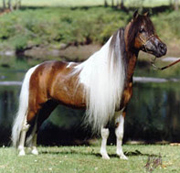 He holds the unequalled record of winning 3 National Grand Champion Senior Stallion titles and 3 consecutive National Grand Champion Get of Sire titles. BUCKEROO's get retain the beautiful head, large yes, graceful long neck, level top line, natural action and balance with excellent athletic ability and the important "look at me" attitude. 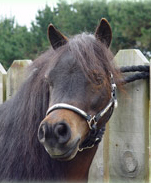 BUCKEROO's get and grand-get won innumerous National Grands, Reserve National Grands, National Champions and Top Ten Awards in halter and performance over the years in AMHA and AMHR Nationals. ORION LIGHT VANT HUTTENEST (USA) 31"